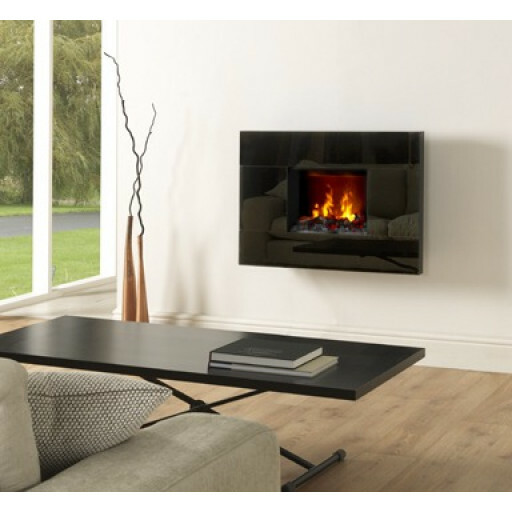 Add a touch of warmth to your living room or bedroom with the Dimplex Tahoe Opti-myst wall-hung electric fire. Featuring realistic-looking flames and smoke effects, you can customise this electric fire to your desired level of flame and smoke with a fully variable intensity control. The Opti-myst smoke creates a realistic effect to evoke the feeling of using a traditional fire. This electric fire also incorporates a 2kW fan heater with two heat settings. The heater can be operated with a remote control for your convenience. The fan operates almost silently, so you don't need to worry about disruptive noise during operation. The Opti-myst smoke and heat settings operate independently for added flexibility, so you can use just one or both at the same time. The sleek and shiny black finish creates a modern look that is ideally suited to contemporary decorative styles. This simple styling adds versatility, making this fire look just as at home with more traditional decor schemes. With recessed installation, the back of the fire can be set into the wall so that only the frame protrudes, saving you space in your room. This elegant electric fire becomes the focal point of your room and is sure to draw attention from guests to your home. All the other wall-mounted fires we looked at were too big but this one was perfect - the smoke effect is fantastic.